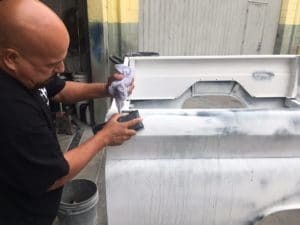 Creating The Perfect Paint Job, Step Five: Blocking | DH Automotive, Inc.
Howdy folks, if you’ve gotten this far in our “Creating the Perfect Paint Job” series, you’ll know that this month we’re going to dive into one of the most important aspects of this series which is Blocking. If not and you’re just getting started you may want to retrace your steps back to our first post in the series, which can be found here. So: Blocking. Why is it so important? Why go through all the concerted effort? Most people don’t realize that when they see a beautiful car at a show, or anywhere for that matter, what they are truly looking at is the shape of the body, period. A vehicle that has been blocked correctly will by far outshine a car where this step has been skipped. You’ll know by the surface, void of waves or ripples, and the mirror finish reigns supreme, especially at night under the florescent lamps, that’s the time when the paint pops. For a good many of you the Blocking process can be intimidating as it’s the most difficult to accomplish, but the way I look at it, you’re only going to do this once on this particular build so why not take it all the way and practice your Zen moves, right? Right! So if your interest has not wavered, let’s get down to brass tacks. Assuming the bodywork is completed and a nice coat of primer has been applied, what you’ll need first is a good set of sanding blocks. I recommend Dura-Blocks, you can find a kit under $100.00 on eBay. Next you’ll need an assortment of sandpaper starting with 150, 250, 320, 400, 600, and 800 grits. You want to wet/dry the majority of your prep, and it will be done using water. You will also need to get a can of flat black spray paint, which can be picked up at your local auto parts store. 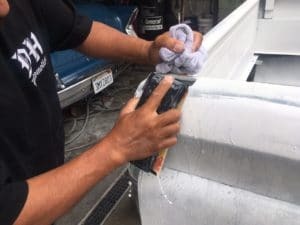 You’ll need this to fog on a guide coat and this process will bring to the surface any imperfections in the body work. You will also need a bucket of water. 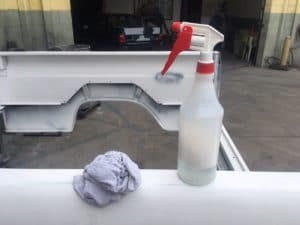 Quick Tip: add a quarter size of dish soap as this will clean the surface of any grease or debris, plus give the sandpaper an easier glide which will alleviate nicks. You want to start with one foot square sections. The grit of sandpaper you need to use depends on how many imperfections you have. If the surface is pretty clean, I would begin with 400, move onto 600, and lastly finish up with 800 before painting. Later, you will use the higher grits when sanding the clear coat after the vehicle has been painted. At this time you have a choice to use a towel (old school), or a spray bottle. 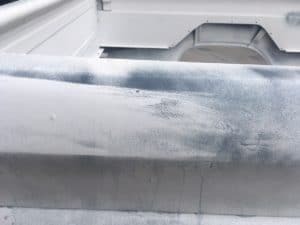 You need to continually wet the surface generously as you sand, as you want the sandpaper to stay clean free of excess primer you remove with each stroke. I personally like to use a spray bottle filled with soapy water to allow my block to not get clogged up with excess primer. You want to use a cross hatch pattern, and once you begin you will see immediately how the high spots will become clean from the guide coat. The low spots and imperfections will still have the black color from the guide coat. Once you’ve finished a section, if you still have low imperfections you will want to use a red putty or glazing putty like the kind you’ll find here. 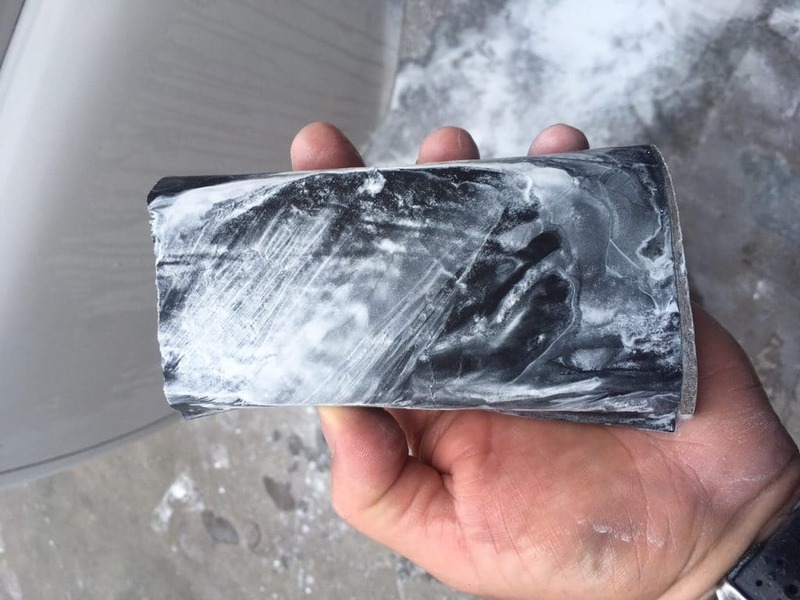 This is used for repairing holes, scratches, and dents that are too deep in the surface. To apply, you will use a very small amount to spread a thin coat over the dents. Note that this stuff dries fairly quickly, hence, once dry you can come back and remove the excess with wet sandpaper. Now again if you cut the primer down to expose the bond, it is a good idea to apply another layer of primer. Begin this process again to ensure a quality job. Once you feel you have done all you can do, it’s time for the water test. Under fluorescent lights, you want to pour enough over the section to observe the way the water cascades over the surface. Now at the same time, track the lights over head in the reflection of the surface to see if there are any imperfections (ripples or waves). If you note any imperfections you’re gonna’ want to retrace your steps and do everything within your power to get it right! If you’ve done it right and there aren’t any, congratulations, you’ve made it through sand city and are ready to move on to the next step which is Paint Prep & Masking, which I’ll lay out for you in Step Six of this series next month! Until then, sayonara my friends!